If you look at a number of the recent customer service award winners it’s pretty easy to see that Superannuation contact centres often feature heavily both centre and individual awards. We stumbled across an article on www.superreview.com.au that delved into how technology, and contact centres, are changing the Superannuation Funds customer experience. The key theme for me was again the need for service differentiation. 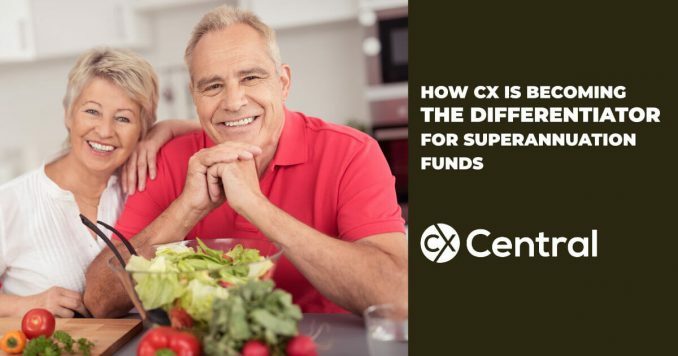 All Superannuation funds essentially offer the same financial benefits (to the average punter anyway) so what sets them apart and gives them a competitive advantage is the customer experience that is underpinned by the technology platform and the contact centre experience. Its a good (but long!) read that scattered throughout provides some insight into how things have evolved, what’s next and the importance of adopting new technologies like Voice Biometrics to enhance the customer experience and improve efficiencies. Financial Synergy’s Bruce Hassad writes that digital service delivery has become the default for superannuation administration. From the era of traditional administration platform technology, where the stereotypical supercomputer database crunched through transactions and endless data matching to today’s ongoing regulatory changes and the emergence of a digital business model, the one thing that has been constant for the super industry is change. And that change is escalating when it comes to the how technology can support the delivery of administration services. Super funds and administrators face a challenge of considering which platform can take them forward to maintain business growth, drive administrative efficiency, and keep pace with the digital changes we face in delivering new services. Open integration with other specialist providers. Funds have different needs and a platform must be capable of integrating seamlessly with work flow, business intelligence and any other external solution required. Increasing integration ensures super funds and administrators can access best of breed functionality and also gain efficiencies as these additional platforms evolve. A platform for everyone. Fund administration has advanced greatly. Process workers and call centre staff now include exception-based knowledge workers who perform different tasks which need to be supported by the platform  the same platform which supports members, employers and advisers. Each audience requires different information and varied processes and specialised user interfaces to maximise efficiency and the user experience. Differentiation. Platform providers need to retain a core offering that delivers high levels of functionality yet at the same time allows each client to differentiate themselves from the competition. The aim is to deliver the costs, scale and efficiencies that super funds and administrators need to stay relevant, while benefitting from the shared nature of the platform. The trick is not to end up with a bespoke implementation. Meeting these challenges is critical. Super funds today looking to succeed and lead the market are demanding a new core technology platform offering that is highly configurable, flexible and one that has the ability to deliver greater differentiation at a lower cost point. There is no choice between scale or services, funds need and demand both. New services are expected to be delivered from an environment that has built a digital foundation and comes armed with a roadmap for continued evolution of fresh content  and a commitment to continue the digital journey and match member’s needs. Over the past ten years, many of Australia’s super funds have planned for and begun their own digital journeys. Around the same time both the super funds and technologists worked together to explore the delivery of an online presence for fund members  focusing on the top three challenges the modern platform needs. With many funds realising they needed a flexible administration platform capable of delivering a broad range of online functionality, the industry highlighted areas of change and for platform vendors, the modern administration platform has evolved to be able to operate in a fully transactional environment. For instance, the top requests to a call centre five years ago are now automatically managed and processed within an administration platform  making it a true platform for everyone. These requests such as updating member details, checking account balances, locating a copy of the member’s last statement, etc. are part of the self-service capabilities for many funds and administrators. What we all thought was pretty or fairly amazing depending on your level of enthusiasm for digital at the time we now describe as “business as usual”. It impresses no-one, least of all fund members  they simply expect it. This frees up the contact centre staff to focus on added value activities, which in turn does impress members. But watch out in another five years it won’t. We need to foster service evolution. We can take a look at this example in action. Also around five years ago we also saw an emergence of a new business model with funds like ING DIRECT Living Super and the digital journey for Australia’s super funds really took off. A fully functional online presence was launched to the market. This innovative approach to digital engagement introduced a new standard for building a relationship with super members and disrupted the industry before disruption was even a “thing”. This online platform was launched as being fast, simple and enabled members to sign up online quickly. It was operationally more efficient than a traditional platform, with reduced running costs and lower fees to the end customer. Taking a look at the challenges that platforms need to solve we need to remember the platform is no longer just about administration but also about the peripheral services that it can enable. The integration of supporting technologies and services has a tendency to deliver a broader uplift to the platform and services the administrator can offer. Case in point is the integration of specialist solutions from workflow providers, customer relationship management experts, data science and analytics organisations and business intelligence leaders. The customers of those specialist providers themselves have driven cross-industry innovation and development and tend to have better road-maps. Those capabilities are now on offer to the super industry in some instances for the first time. Superfund and administrator, Vision Super has recently replaced its platform with specialist best of breed solutions to deliver a platform now capable of responding to the changing demands of employers and members. This transformation also introduces a new partnership business model for those smaller funds possibly seeking an alternative to a larger administrator. Australia’s super administrators are addressing the future delivery of new services that are more sophisticated with a transform of the underlying platform technology. For example, when multiple fund client platforms are transformed into one highly configurable and flexible core platform, the business is transformed to an environment capable of delivering change. With such a core platform transformation, such as the recent case of Pillar Administration consolidating from nine systems to a central solution, administrators are able to build a straight through exception-based processing capability and produce a more efficient and highly cost-effective operational environment. Superfund clients housed within that platform can each be treated uniquely, differentiated by the platform’s software layer which can develop each fund’s unique products, services, fee structures and digital experience offerings. The reality for many administrators is that they more than likely provide a service to different client super funds and sometimes those services vary. Universally those client funds are looking for ease of operability from their own member perspective. With many Australians not paying attention to their super savings until they are in their 40’s, the goal for funds is to make it easier for the member to engage with their super whether that is by mobile app, tablet or smartphone. For Pillar, the process includes reviewing member service organisations from other industries around the world and looking to apply the learnings internally. The executive team is making sure that the customer is part of the process for driving innovation. When asked how global digital disruption trends are influencing its customer service level, it highlighted an area of exploration around biometrics is underway to better understand how to recognise members and contemplate solving the challenge of PINs and passwords whilst keeping super safe and secure. The next round of services will need integrated tools beyond apps and mobile capabilities to further enhance the customer service offering. And for other administrators, overcoming operability service challenges to deliver better member services is expected to potentially open up new business opportunities. Papua New Guinea-based Kina has addressed the challenges of delivering its new services with the move away from typical processing functions to a digital delivery platform. With greater automation and streamlined efficiencies, its new Service Level Agreement for fund clients is a new business offering in itself. Targeting a one-day turnaround for all queries it is resolving 80 per cent of member queries under four hours, allowing the administrator to reduce its risk profile, be more efficient and deliver value outcomes. Plans for the future include adding funds to its administration portfolio and building the scale, skills and cost benefits that local and Australian superannuation funds will find compelling. On its agenda is a plan to reform the processing of superannuation in PNG along the lines of Australia’s SuperStream standards. Kina can fully automate the matching of employer contributions to member accounts courtesy of its platform technology, giving it a home country advantage and greater competitive advantage in the region. Today Australia’s first online-only super platform has moved beyond the online world and its initial goal to make its members more curious about their super balances. And if you are wondering what the funds that have also built a strong digital platform are focusing on next its tools. These tools move beyond online calculators to better support the customer experience and aim to enhance the retirement savings outcome. They work by being embedded into the customer service experience from day one. Interaction from the moment the member joins is easier and guidance can be provided to better explain investment choices and their relevance to fulfilling super savings goals. Tools can also automatically provide options and educate fund members on adequate savings choices relating to current income and retirement expectations. The guesswork from fund investment choices may be removed and there may be a greater level of engagement across all ages with Australia’s valuable superannuation funds stockpile. The challenge for platform providers is to stay ahead of the game and deliver the functionality innovative administrators will demand. And the challenge for the administrators is to ensure they choose the right platform provider and are engaged in the roadmap to drive that innovation rather than be a passenger.